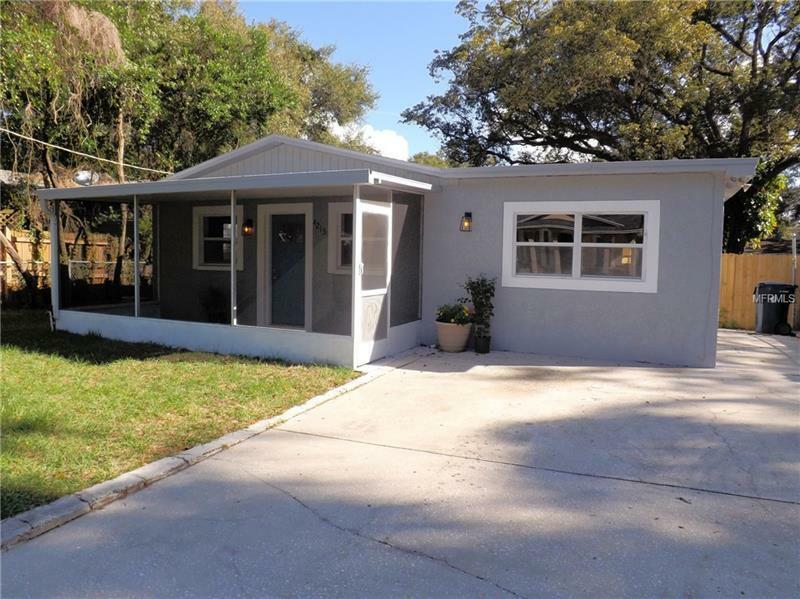 Seminole Heights block home has been renovated with style! Contemporary, Stylish, Cozy, Hip- whatever comes to mind you will love this 3/2. This home makes the most of 960 sq ft. (1109 sq ft when including the screened front covered patio. The kitchen is completely remodeled with Calcutta Quartz countertops, white cabinets, stainless steel appliances and matching backsplash of glass and stainless mosaic tile. Fully renovated bathrooms (2) with new modern 3D wave tiles in a stacked pattern. New tubs, new vanities with drawers, new light fixtures and very cool waterfall effect faucets. New ceiling fans throughout. Interior washer and dryer hook-up. Large back yard with new Privacy fence and new sod front and back. Small attached storage shed that houses the water heater and space for gardening tools. New shingled roof installed 2018. New floating LVP flooring through. Large yard certainly could accommodate an addition or an in-law suit. Investors this is a turnkey property perfect for Airbnb or short term corporate rentals due to location. Less than a block from much higher priced new homes. Convenient distance to numerous popular Heights food and beverage establishments. Minutes from Ybor and downtown. Oh, and at under 200K. whatâs not to love?